On behalf of the Norceca Confederation, the FIVB, the South American Volleyball Confederation and the Pan American Volleyball Union, the best players of the Final Four Tournament were recognized at the Awards Ceremony after the gold medal match. Peru achieved five prizes, while The Dominican Republic, 4. The Best Attacker was Jessenia Uceda (PER), while the Best Server was Elena Keldivekova (PER) who also earned the honors as Best Setter. Another Peruvian player, Vanessa Palacios, won the Best Reception, while Dahiana Burgos from the Dominican Republic was the Best Scorer and also the Most Valuable Player. 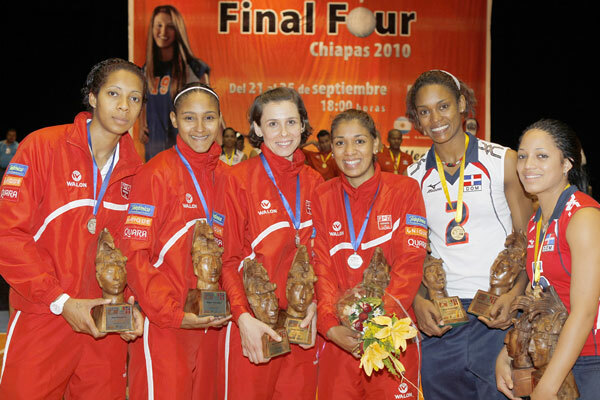 Peruvian captain Leyla Chihuan was the Best Blocker, while Dominican Brenda Castillo was the best Libero and Best Defender.